I had the pleasure of visiting my cousin in Los Angeles this summer (making this a super delayed post). During my trip, I had to find tea, obviously, and we ended up at The Grove Farmer’s Market. I was prompted in remembering this lovely outing after watching this week’s episode of The Next Iron Chef: Redemption on the Food Network. They took photos at the Market during the beginning of the episode. Yep, that happened. Aren’t all tea addicts TV addicts too? Or is that just me. At the market, I found a delightful booth selling all sorts of loose leaf tea, and the prices were pretty fair too! 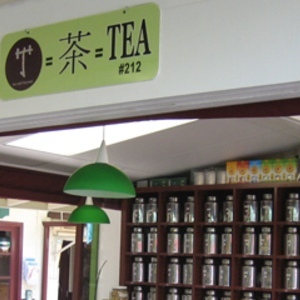 You can check out some reviews on Steepster (the tea shop itself doesn’t have the best website). I picked up a few teas, including some matcha at a reasonable price, compared to other tea shops, and some deliciously sweet pomegranate white tea. Of particular note was the Key West green rooibos. Unfortunately, I don’t have a list of ingredients (they don’t have fancy packaging, which is probably one of the reasons I found their tea to be ‘cheap’ in comparison to others). It’s a sweet green rooibos herbal blend, but not overly sweet like many others I have tried – it’s a perfect blend making the rooibos a perfect amount of sweet. So if you’re in LA (I’m already jealous cause you still have warm weather), check out the tea booth and see what you can find!